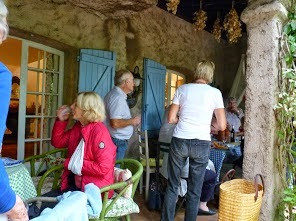 It was five years ago, 23 June 2009, that we last visited 'Jardin la Pomme d'Ambre'. Although early autumn is a period in which not many plants are in flower, this garden has so many points of interest that you don't miss the lack of flowers. 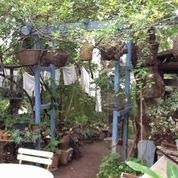 The owner, Nicole Arboireau, told us that when they built their house 34 years ago, the garden was a blank canvas, apart from the local wild vegetation, a Cork Oak and an Aleppo Pine. 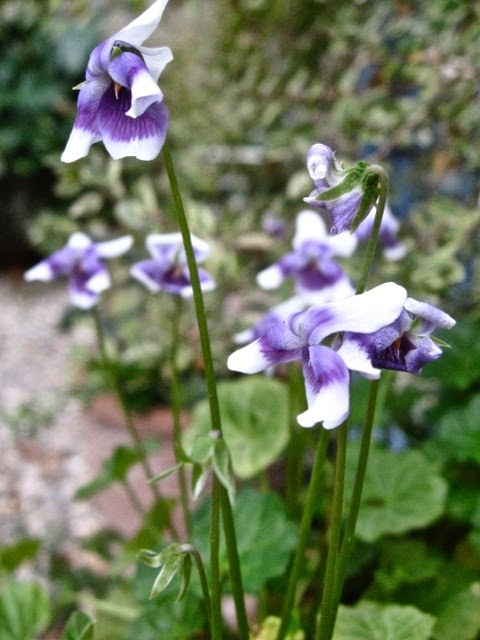 The garden was sloping downwards towards a stream, normally dry, but in wet periods it can become a torrent. Her husband built the walls (restanques), to prevent the earth from slipping down towards the stream. When each section of wall was finished, Nicole started planting. 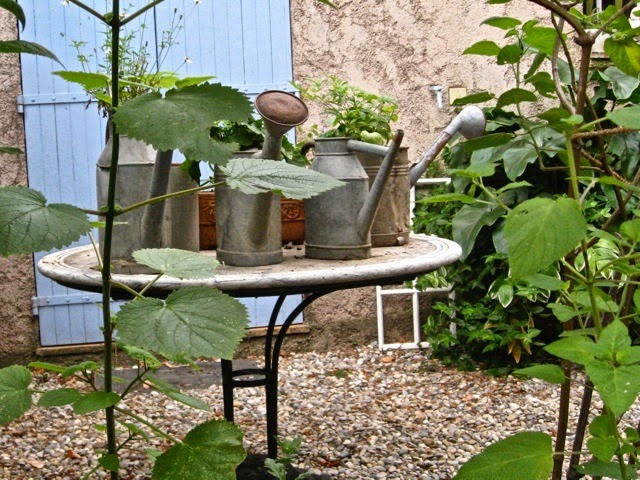 As they were short of money after building their house, all the plants were from seeds or cuttings. It is hard to imagine looking at the garden today. She used either local Mediterranean plants or plants introduced to the Côte d'Azur during the late 19th and early 20th century from China, Japan and Korea, a few from the Americas, like the palm tree 'Washingtonia', as these plants had proved to be suitable to the local climate. 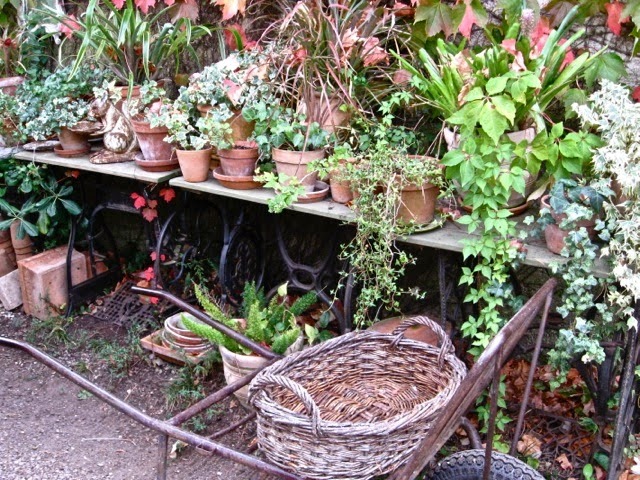 A good time to visit the garden is after some rain at the end of October right up to February. Several of the roses are in flower at that time of the year. There are 200 roses in the garden, some flowering in autumn and spring, some just in March and April. 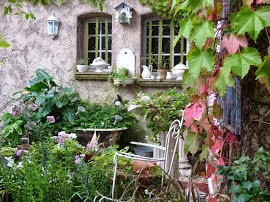 Nicole only planted old roses, mostly climbers and ramblers, as they are more resistant to diseases. A lot of the roses are Narbonnand roses, a pepinière in the Golf St Juan in the late 19th and early 20th century. Some of these roses are still being sold today. 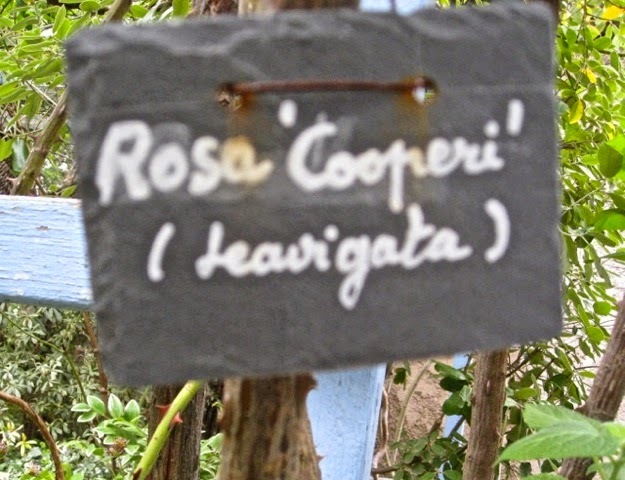 She has 4 different varieties of Rosa banksiae; 2 whites ones - a single, Rosa banksiae var. normalis and a double one, R. banksiae 'Alba Plena'; 2 yellows ones - a single, Rosa banksiae 'Lutescens' and a double, Rosa banksiae 'Lutea', all available from Pepinière l'Armelette in Sillans la Cascade. 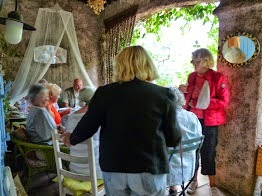 Our tour started around the house. 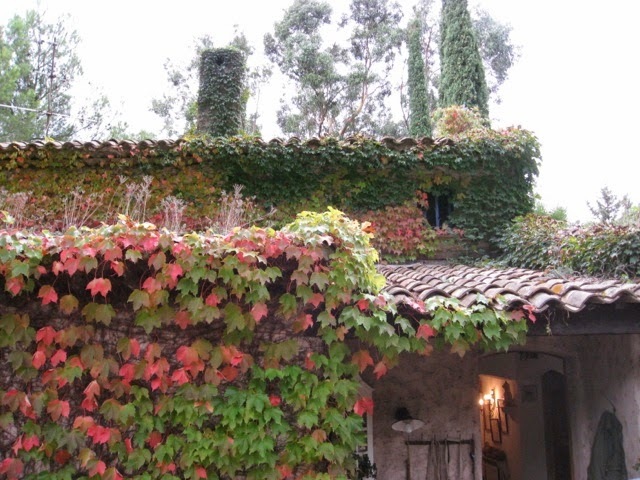 The house has climbers on the roof as well as on the walls. We asked Nicole if she was not worried they would damage the roof, she answered that the creepers had not caused any problems for the the last 34 years and she could not imagine they would, not in her lifetime. Some of the climbers: Ipomea purpurea (Common Morning Glory); various varieties of Jasmin, Jasminum azoricum, a yellow flowering - Jasminum mesnyi; Parthenocissus quinquefolia (Virginia Creeper); Rosa banksiae; Rosa laevigata; Solanum jasminoides, to name a few. She planted from seed a Eucalyptus globulus. In the winter of 1986 it was hit by frost. She thought it was lost, but it grew from the stump and is now 25 m tall. 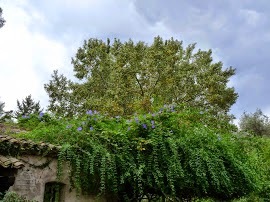 A Wisteria is climbing through the Eucalyptus branches right to the top. 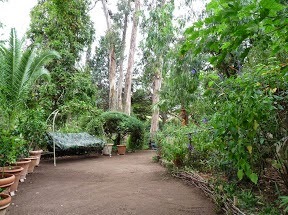 The peeling bark of the Eucalyptus is shredded finely then spread onto the paths. 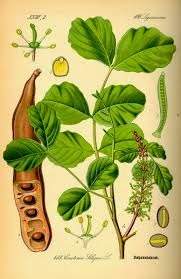 Another tree planted from seed is the Carob Tree, Ceratonia siliqua. It has grown 5 m in 15 years old. 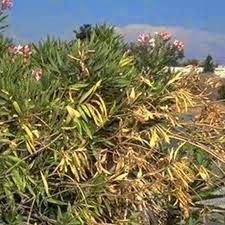 An interesting tree, the pods are a source of carob, a chocolate substitute. The seeds are large and fairly even in size and a constant weight, they were used as the original 'carats' by jewellers. 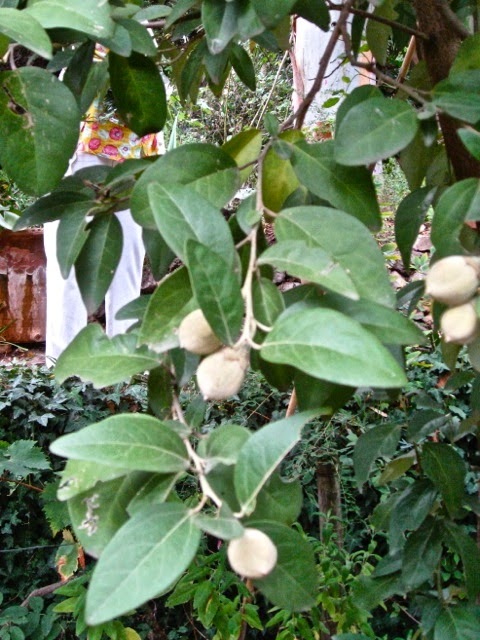 As so many of us, Nicole is experiencing dye-back on her Buxus, she mentioned two different shrubs that could replace Buxus - Lonicera nitida and Myrsine africana. Following the path down to the stream bed, we came across her collection of ivy's. As we walked along, Nicole cut off the tops of plants and gave us cuttings. 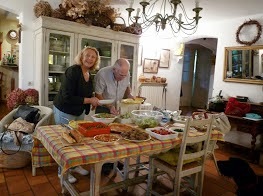 She mentioned that on returning home we should first put the cuttings in water, so that they could replenish their thirst, before planting them as cuttings. 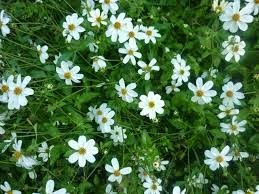 I think everyone got a cutting of Bidens 'Pirate Pearl' a creeping white flowering Bidens. 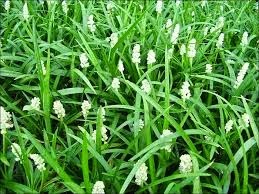 and for those interested, Nicole gave away plants of Liriope muscari. 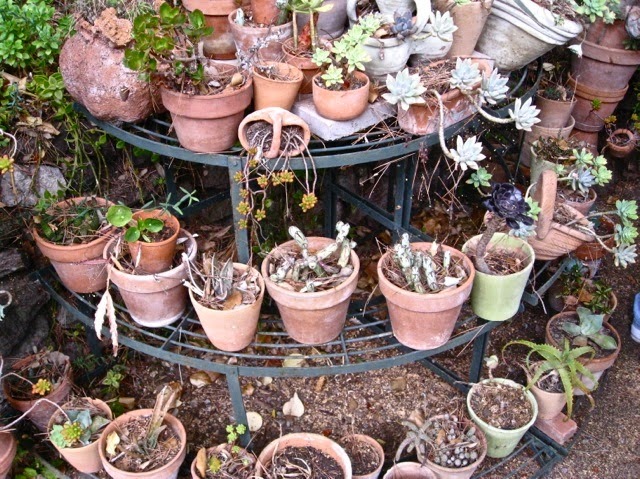 She is known in the area for collecting used pots. 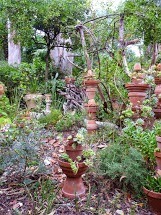 Not so long ago she received a phone call asking her if she would like 300 used pots. 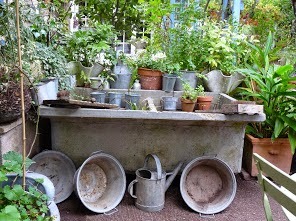 The people delivered the old pots to her house. Both parties were happy, Nicole got her pots and they cleaned out their garage. Her ideas are never ending. One border, the white and cream border, is totally planted with baskets holding spring bulbs. 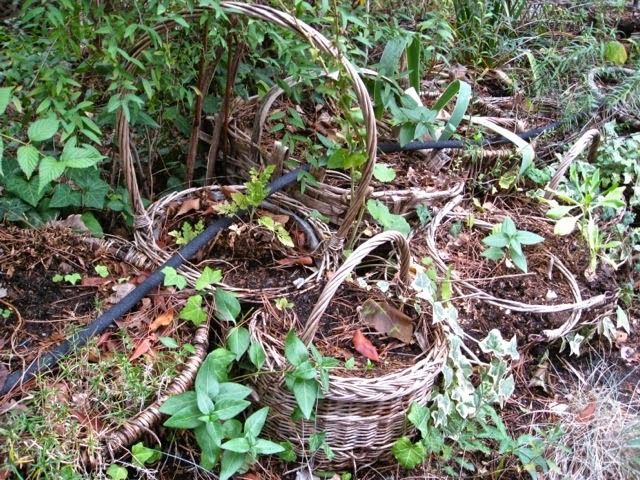 The baskets are allowed to disintegrate, they will then be replaced. 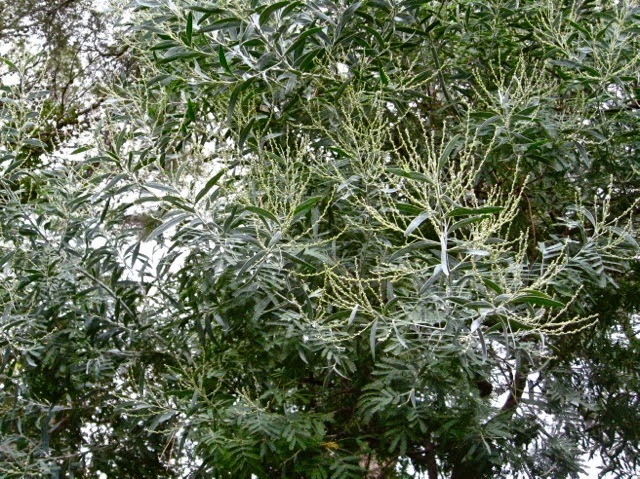 Apart from Acacia 'Hanbury', with two different type of leaves on the same branch, an entire and a pinnated leaf, there is a Acacia retinodes, commonly known as 'Mimosa des Quatre Saisons' now in flower and Acacia karoo, with it sharp spines. 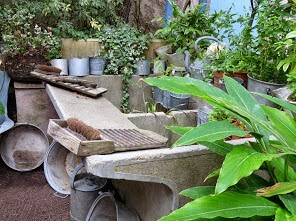 We passed an old 'Lavoir', a wash-house with wash boards. 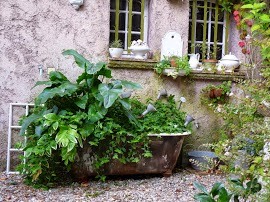 When Nicole came across it, it reminded her of how her mother used to wash the family's laundry in a the lavoir near where she grew up in Fréjus. 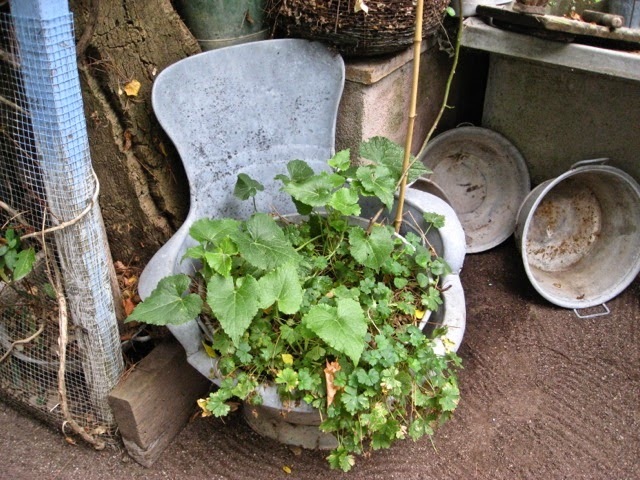 It was a 'must' for her to introduce it into her garden. She then hung up a washing line with 'turn of the century laundry', changed every year. 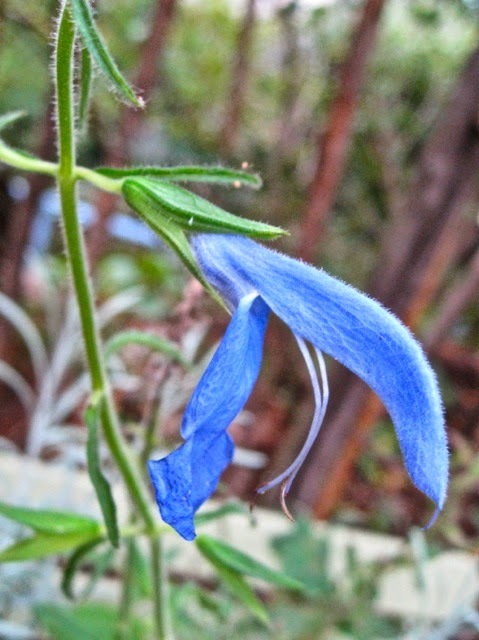 There were many Salvia's growing in the garden, quite a few of them in flower. We all got a cutting of Salvia confertifolia, a large orange coloured Salvia and the beautiful large blue Salvia guaranitica. In addition there were: Salvia buchananii (bright pink and hairy), Salvia miniata (red flowering, Salvia neurepia (pinky-red), Salvia involucatra (bright pink with white tips, Salvia mexicana (blue flowering and Salvia patens. 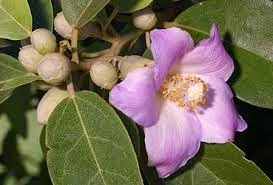 Most of us were given a large seed of a tree, Lagunaria patersonia. The seed has a nasty, hairy skin, a bit like a cactus. We were advised to dry out the seed and then plant the seeds. Hopefully some of us will be successful. 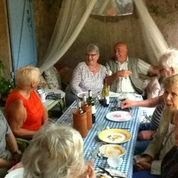 A new arbour was simply constructed by using 4 strong posts, fastened between the posts, horizontally and vertically, an iron mesh (same mesh used when laying concrete flooring). 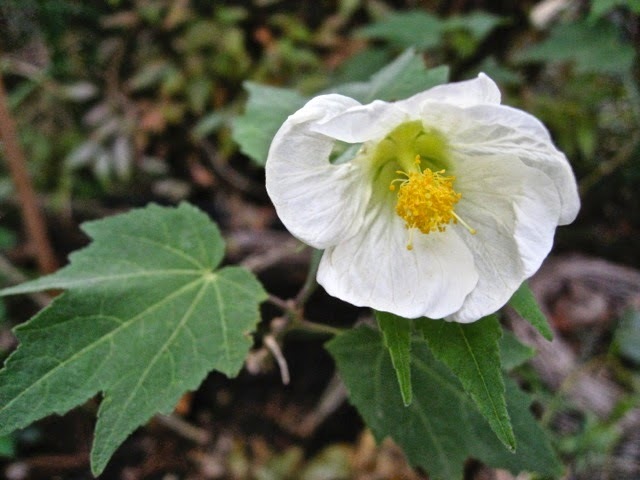 Abutilon megapotamicum was planted at intervals to eventually cover the arbour. 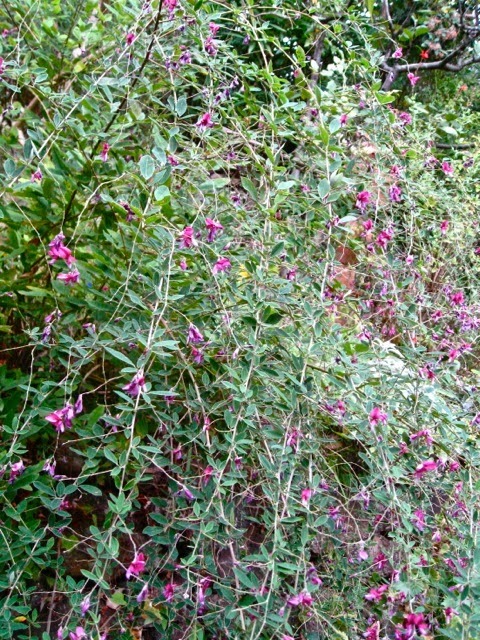 Lespedeza thunbergii, as it matures over summer, tends to hang its branches. Nicole has a perfect solution, she planted it on a restanque, so it could hang over to next restanque. 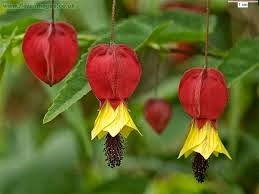 This was not the only Abutilon in the garden. A few people got a cutting of Abutilon pictum, an orange flowering Abutilon with a variegated leaf. 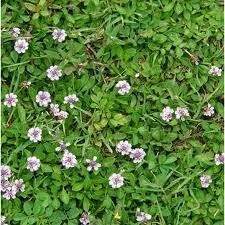 An alternative to grass is Lippia nodiflora, with small pinkish-white flowers. For those interested, I've seen it for sale in l'Armelette. 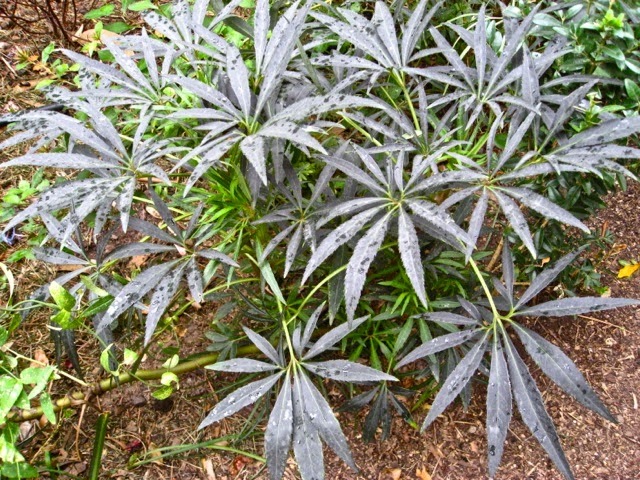 We are all familiar with the cultivated Oleander, but I think few of us knew that there is a native Oleander, Nerium oleander, which is protected and is not allowed to be chopped down. 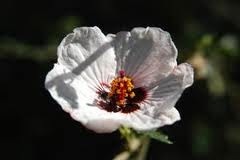 Pavonia hastata was in flower, a shrub with Poppy like flowers. 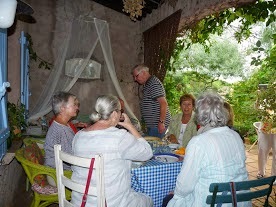 After our tour around the garden it was time for our picnic. 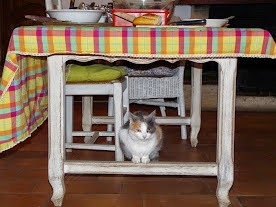 Nicole offered her dining room table for our dishes. She mentioned that she had never seen a picnic like ours, such a spread. 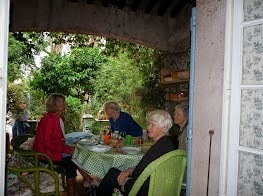 We had our lunch on the terrace, protected from the rain, which had started just after we finished the tour of the garden. 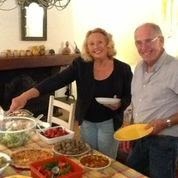 Thanks to Jacqueline for our menu and Elisabeth and Isabel for the photos.